Barrhaven Honda | Blog | 2018 Honda Accord Sedan: Clearing Out Now! 2018 Honda Accord Sedan: Clearing Out Now! Honda first unveiled the Accord all the way back in 1976. Since then, there have been 11 generations of the vehicle, the latest arriving with the 2019. Though the 2019’s are already available in showrooms, there are a few reasons you might consider going with last year’s model. For starters, imagine if you could drive off in a brand new car without paying the brand new price tag. Well, that’s exactly what can happen when you shop for a 2018 Honda Accord Sedan this December. In order to make room for new models, dealers need to empty out the 2018s and that could mean clear out pricing for you. Still, you might be hesitant. Like with smartphones, having the latest vehicle model can be appealing. However, with loads of impressive specs and features, opting for the 2018 Honda Accord Sedan hardly feels like settling. What Does the 2018 Honda Accord Sedan Offer? Touted as, “The Oscar’s of the Auto Industry”, the North American Car, Utility and Truck of the Year Awards recognizes excellence in innovation, design, safety, performance, technology, driver satisfaction and value. This year, the Honda Accord earned the prestigious 2018 North American Car of the Year – further proving its quality and excellence. • Collision Mitigation Braking System™ (CMBS). • Forward Collision Warning (FCW) – Integrated into CMBS. • Lane Departure Warning (LDW) – Integrated into RDM. • Road Departure Mitigation (RDM). • Lane Keeping Assist System (LKAS). • Adaptive Cruise Control (ACC) with Low Speed Follow. Additionally, the Accord comes with standard and available safety equipment, including multi-angle rear view camera with dynamic guidelines, front and rear parking sensors, a rear cross traffic monitor, driver attention monitor and a pedestrian injury mitigation design. 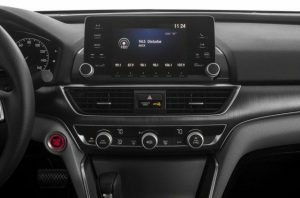 The 2018 Honda Accord Sedan was Honda’s second model to receive the all-new infotainment system. Featuring an 8-inch touchscreen, easy to use knobs and reconfigured settings, this new system is a serious upgrade to previous versions. With an elongated wheelbase, the 2018 Honda Accord Sedan comes with a roomy trunk great for storing big or bulky items. At 16.7 cubic feet of cargo space, it is certainly bigger than Civic models. The 2018 Honda Accord Sedan was bumped up to a 1.5 litre, turbocharged four-cylinder engine, putting out 192 horsepower and 192 lb.-ft. of torque. For more than four decades, the Honda Accord Sedan has won over car buyers with its simple design, fuel efficiency and reliability. Though the 2019 models are already in showrooms, there are still a number of reasons to consider the 2018 Honda Accord Sedan. Not only is the 2018 a great vehicle, touting a number of superior features and specs, right now it will also come with an appealing price tag. To learn more about the Accord or to see what clear out deals are available, set up a test drive today.